Anthony Fusco as Charles Condomine and René Augesen as Ruth Condomine in Cal Shakes’ production of BLITHE SPIRIT, directed by Mark Rucker; photo by Kevin Berne. We go to a play at Cal Shakes with Mike and Linda every summer, generally preferring something that is NOT Shakespeare. I’ve been doing this since before I knew Gail, about 20 years now. Today, we saw Blithe Spirit, and Mike declared it the funniest thing we have ever seen there. Now you might think that if you patronize a theater for two decades, you would get better seats, but you’d be wrong. We were in the very last row, on the side that gets too much sun. Not that it matters much–there isn’t really a bad seat in the house and we needed the sun as the fog was rolling in. This may be sunny California, but I had my leather jacket and my gloves along for a good reason. The performance was fantastic, and what else really matters? Noel Coward was a brilliant writer, and this is perhaps his finest work. What we have here is the simple story of Charles and Ruth Condomine, a middle-class couple in pre-war England. Charles is a writer of popular novels, and invites a local medium to visit their home for a seance, to gather material for his next book. 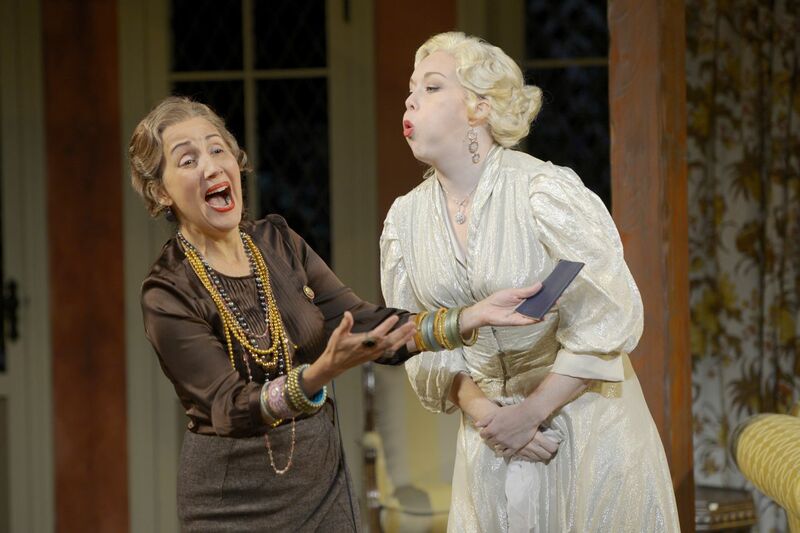 Domenique Lozano as Madame Arcati and Jessica Kitchens as Elvira Condomine in Cal Shakes’ production of BLITHE SPIRIT, directed by Mark Rucker; photo by Kevin Berne. The seance goes awry, though, when the spirit of Charles first wife, Elvira, is brought back, and Charles can see and hear her, although nobody else can. Elvira is petty, vain, snarky, viscious and jealous of Ruth. She wants Charles back in the worst way–quite literally. Her plot to kill Charles so he can join he in the afterworld goes awry, though, and she kills Ruth instead. Then things get really complicated. Another seance is held, much more cattiness is spewed between the women, and finally they are sent back to wherever we go after we die. The plot is one thing, the explication is another. Noel Coward was a master of dialogue, and the reparteé is priceless. Speaking all those brittle lines takes a lot of talent, and the cast is more than up to the challenge. Cal Shakes is blessed to have some of the finest actors available, and there isn’t a weak player in this cast. The role of the medium, Madam Arcati, played by the tremendous Domenique Lozano, is an actors dream for a comic turn, and Ms. Lozano makes the most of it. 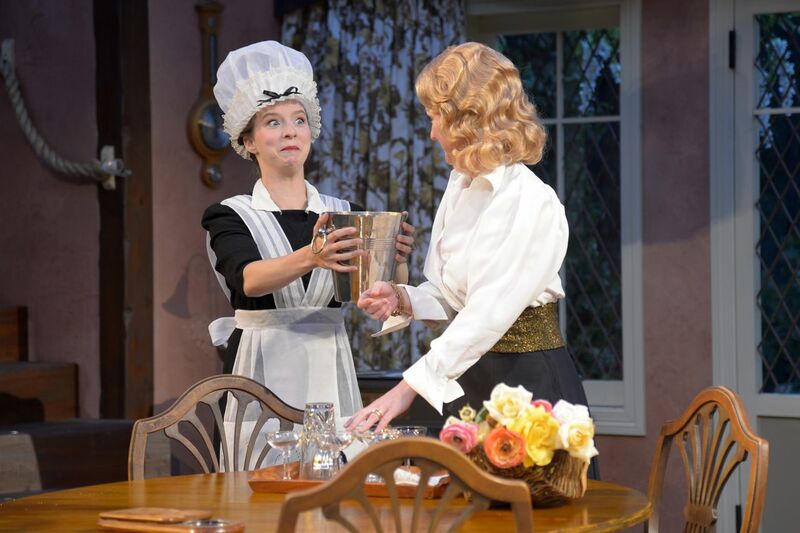 Rebekah Brockman as Edith and René Augesen as Ruth Condomine in Cal Shakes’ production of BLITHE SPIRIT, directed by Mark Rucker; photo by Kevin Berne. An old show business maxim is “there are no small parts, only small actors”, and it was never more true then the part of the maid, Edith. As far as I’m concerned, Rebekah Brockman completely steals this show. Her every scene is perfect, every motion, every expression. I’d go see this play again just to see her. 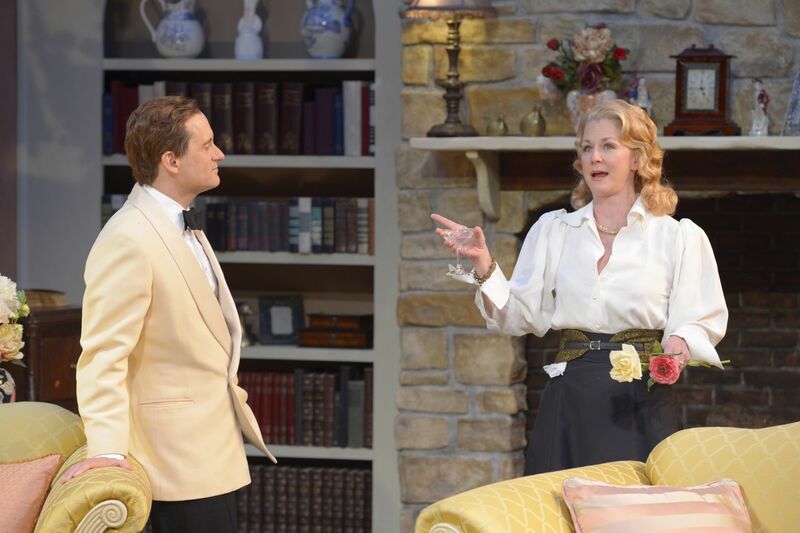 Blithe Spirit runs through next weekend. If you need a good laugh, go see it. I think they said Noel Coward wrote this play in less than a week a it was performed during WWII to lift up the spirits in England. We try to go about once a year too.